While we would have preferred the 'Cooked' was in the same font as the 'Kettle', we like the little green hat as much as we don't like the dodgy drawing of the Jalapeno Pepper. The Herr's heritage is captured really well by the sepia photographic background. The Chips look well seasoned and even the Herr's logo stands out in its prominent red color. A big thumbs up. Although these Chips seemed smaller than some Kettle Cooked Chips there was still a fairly firm crunch to them. The crunch did seem softer than some, but they still provided a crunchy crisp munch. A good quality Kettle Cooked Chip texture. While these Chips were not quite as thick as some Kettle Chips, there was rigidity and firmness. There were a few oil bubbles on the surface of the Chips but this didn't lead to many cracked and broken Chips. As the packet detailed, there were green flecks on some of the Chips. Many of them were on the small side, but there was still room for curly and irregular shaped Chips in the bag. A nice sweet pepper aroma hit us during the Bag Plunge test. And they were hot. 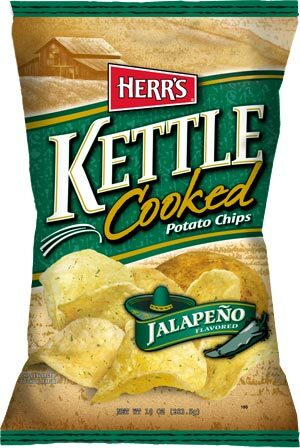 So many Jalapeno Chips lack something, not just a bite of heat, but flavor. The relatively high sugar and salt content clearly mixed well with the potato to make these among Herr's most flavorful Chips. The heat was a really good balance between - Chips for all and Chips too hot for some!